Allegory and symbolism are related since both are meant to convey a meaning that is different than the thing directly presented. 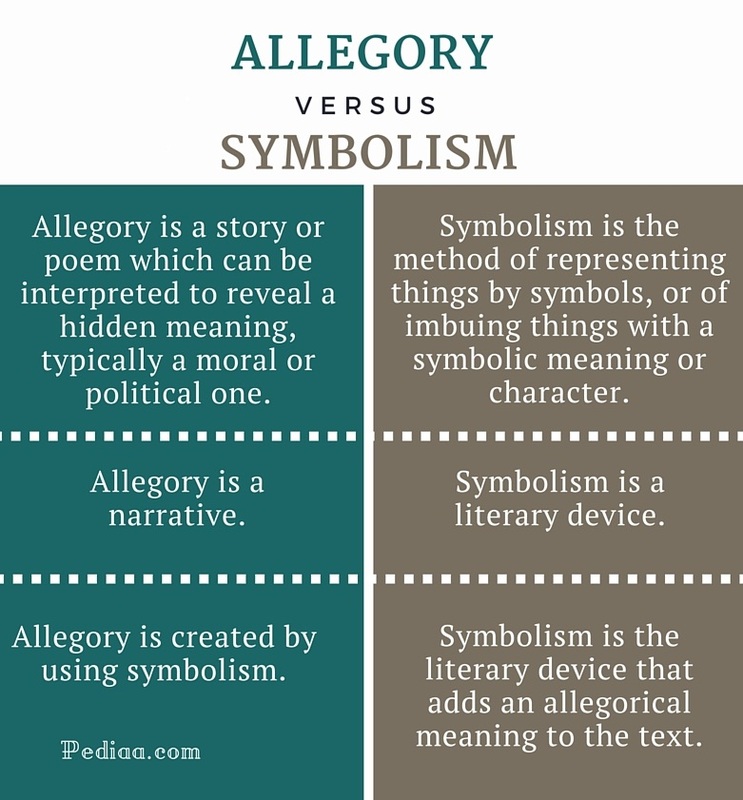 However, allegory is a narrative, a poem or story, that can be interpreted to reveal a hidden meaning whereas symbolism is the use of symbols to signify ideas and qualities. The main difference between allegory and symbolism is that allegory is a story or a poem whereas symbolism is a figure of speech. Allegory is a story or poem which can be interpreted to reveal a hidden meaning, typically a moral or political one. Abstract ideas and concepts, political or historical situations are represented through the characters, events and the setting of the story. Although the story in an allegory appears to be simple, it always has a more serious, deeper meaning; the characters and the events of the story may also stand for something larger than what they literally stand for. Therefore, the story and characters are multidimensional. For example, let us consider the ‘Allegory of the Cave’ by Plato, which is one of the most famous examples of allegories in the history. In this story, Plato describes a group of people who have been chained to the wall of the cave their whole lives. He then goes on to describe how an escaped person would find the reality outside the cave. The people chained in the cave represent the ignorance, and the light outside the cave represent knowledge in this story. Another example of allegory is George Orwell’s ‘Animal Farm’. Orwell uses animals to represent the overthrow of the last of the Russian Tsar Nicholas II and the Communist Revolution of Russia. For a person who has no idea about the political background of Russia, this story would read like a simple story of animals. But the underline political ideas come to light when you look at the novel in a political point of view. Pilgrim’s Progress by John Bunyan, The Lion, the Witch, and the Wardrobe by C.S. Lewis, Edmund Spenser’s Faerie Queene and The Lord of the Flies by William Golding are some other examples of allegories. 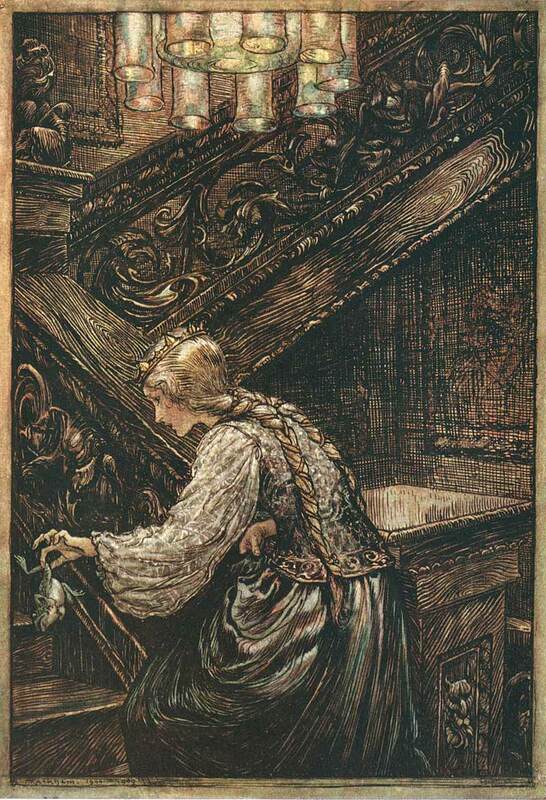 Psychiatrist Carl Jung states that the tale of Frog Prince is an allegory of a young woman’s passage from youth into adulthood and her corresponding change of perception of men. Symbolism is the use of symbols to signify ideas and qualities. Symbolism gives an object a symbolic meaning that is different from its literal sense. In symbolism, an object or character is imbued with a particular meaning that it does not have by definition. In literature, symbolism is used as a literary device to represent great qualities, or abstract qualities using characters, objects or setting. For example, in Nathaniel Hawthorne’s The Scarlet Letter, the scarlet letter (the letter A) stands as a symbol of adultery. In Joseph Conrad’s Heart of Darkness, the darkness symbolizes the evil. Allegory is a story or poem which can be interpreted to reveal a hidden meaning, typically a moral or political one. Symbolism is the method of representing things by symbols, or of imbuing things with a symbolic meaning or character. Symbolism is a literary device. Allegory is created by using symbolism. 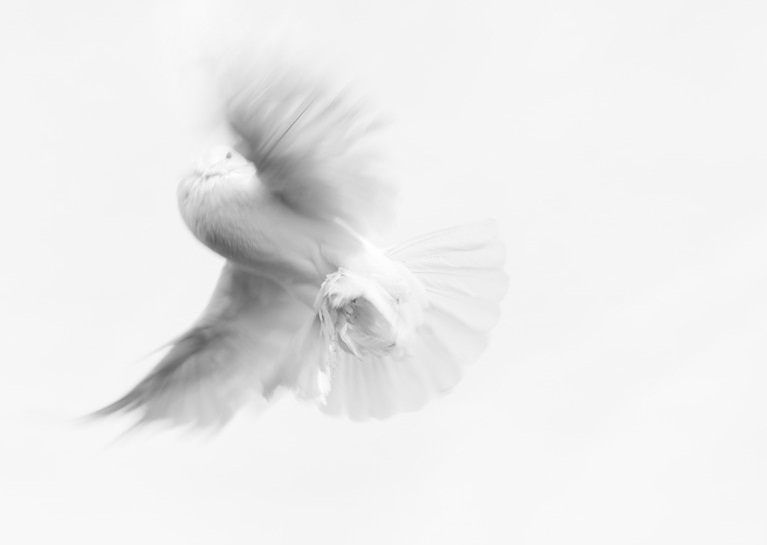 Symbolism is the literary device that adds an allegorical meaning to the text.